Mahmúd writes: "The friends arranged a banquet in commemoration of the Day of the Covenant and the journey of the beloved of all hearts. Today many came to the Master with bouquets of flowers in their hands. 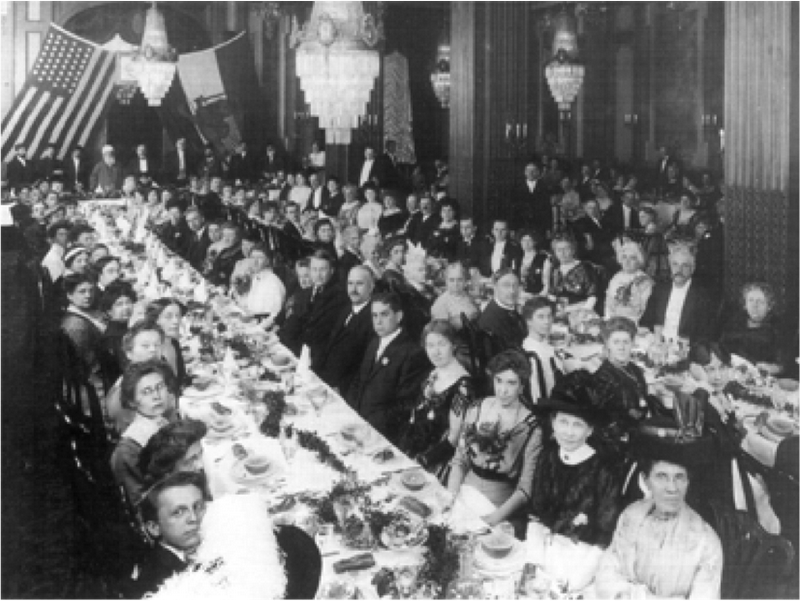 The banquet was held in the ballroom of New York's Grand Northern Hotel. The hall was decorated similarly to that in Washington with festoons, banners, ornaments and exquisite screens, with the Greatest Name suspended above all on the stage in its customary calligraphy. In the center of the ballroom were two rectangular tables, between which was another large table exquisitely set. Around these tables on both sides were placed small circular tables bedecked with colorful flowers, a variety of sweets and crystal glassware. The electric lighting reflected the glassware and caused the whole room to shine brilliantly. More than three hundred guests, formally attired, attended. Several friends and specifically Miss Lany Lead served at the banquet. When the Master appeared, all rose from their seats and with smiling faces cried out, `Alláh-u-Abhá!' Many of the hotel guests saw the banquet and were astonished to see the grandeur of the Master and the sincerity and enthusiasm of the friends. After the Master took His seat, Mr Hoar, on behalf of the Bahá'ís, read an address of welcome expressing obedience and firmness in the Covenant. The Master rose and responded with an address about the divine teachings and the oneness of humanity. He then walked around the tables and perfumed the heads and faces of the friends with attar of rose. When He returned to His chair, the friends, accompanied by the piano, sang songs of praise to Him. Later the Master spoke about the wars and massacres of the nations and the need for the teachings of the Greatest Name. He encouraged all towards peace, harmony and sincere love for all the people of the world. After His talk, the Consul General, Mr Topakyan, and others gave short speeches praising `Abdu'l-Bahá. This evening's banquet was so grand that the hotel staff were curious to know about the Cause. They came to see the Master to ask about the banquet and why so many distinguished Americans were praising and glorifying a person from the East. Indeed, it was a banquet for a king and a source of awakening to every person of insight. Two photographs were taken with a good quality glass and special lighting. 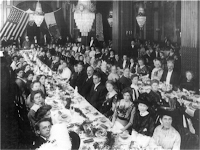 Although the photographs do not show the entire group, they tell much about the banquet." What a stunning occasion! So beautiful, elegant, formal. Don't you wish we all had a place there? To arrive with flowers and place them in the hand of the Master. And what an example--to have a social occasion be a "source of awakening to every person of insight." Of course, it signaled the end of His time there--so there must have been a poignant rapture. But what Mahmud does not tell us here is that the African-American guests could not attend the banquet. The hotel proprietor was adamant--and the more the Baha'is tried to convince him that diversity was important for them, the more he stood firm. So, the following night another banquet was held at the Kinney home--and the white friends served the dark friends. It is this scene that we have beautifully captured for our film. When Abdu'l-Baha says it was an example of the "grandeur of the Covenant" we know then that something was missing for the banquet held at the Great Northern Hotel. . . .